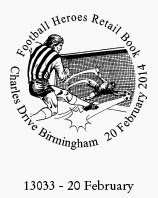 The original Football Heroes issue included a retail booklet containing the stamps of Bobby Moore (England) and George Best (Northern Ireland) and four 1st class Machin definitives. 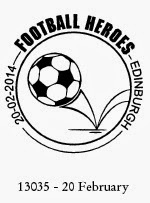 The second retail booklet will be issued on 20 February 2014 containing the stamps of John Charles (Wales) and Dave Mackay (Scotland). 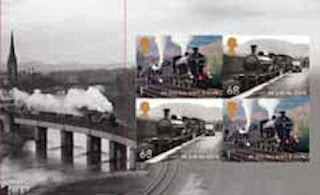 These special postmarks are available for the booklet, which is issued on the same day as the Classic Locomotives of Wales miniature sheet. 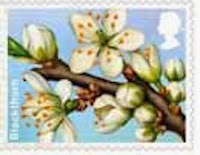 Stampex postmarks will also be available. Which 10 stamps would you rescue to take to a desert island ? 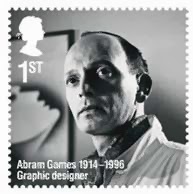 In March 2014 Royal Mail celebrates another selection of remarkable individuals from the realms of sport, design, economics, heroism and the arts. The set commemorates individuals who were born in 1914. 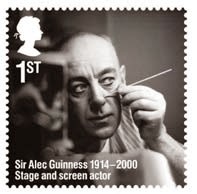 Royal Mail's Christmas-period press release showed only the Sir Alec Guiness stamp, but also from the stage and films the set includes Kenneth More and Joan Littlewood, and from broadcasting Roy Plomley, famous for creating the still-running radio programme Desert Island Discs. 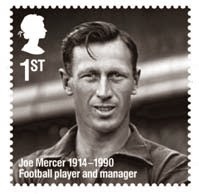 Welsh poet Dylan Thomas and football player and manager Joe Mercer are also included. 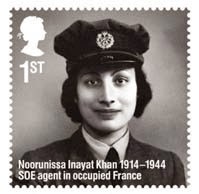 Less well known are economist and broadcaster Barbara Ward, molecular biologist and Nobel laureate Max Perutz, Special Operations Executive agent Noorunissa Inayat Khan executed by the Gestapo at the age of 30, and graphic designer Abram Games who designed the Festival of Britain emblem, amongst many other posters. The 10 black and white stamps will be 35mm square and printed in litho by International Security Printers and issued on 25 March. 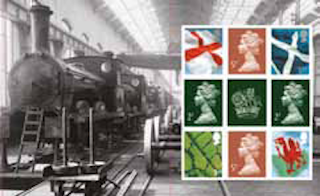 The set will be printed in two sheets of 25 stamps enabling collectors and users to buy multiples of a single design. 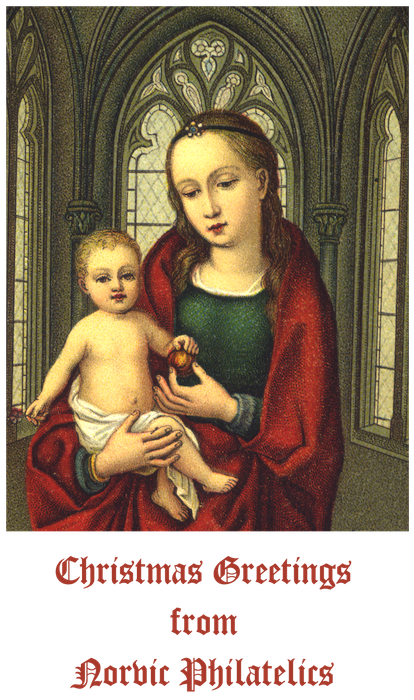 Happy Christmas to all our readers! If you read the blog you are one of over 1400 a day! It seems that the people who use Royal Mail international services are confused - that's if you believe the latest consultation paper on changes to their international services. It doesn't really matter to me whether the basic service is Airmail or Surface, or whether the name is changed to International Standard and International Economy - people will still go into their Post Office branch and ask for Airmail or Surface, just as they still ask for Registered, even though that terminology was dropped in 1993! I suppose the reason for the other changes is as much to satisfy eBay/PayPal requirements as anything else. Currently we have International Signed For (ISF) (which satisfies the UPU requirement to have a Registered service) and Airsure (for the Express service). The latter is tracked all the way and scanned on arrival, but a signature is not needed: you may have noticed similar standards applying to some incoming mail. ISF is signed for on delivery (or should be), but tracking is hit or miss. It is certainly tracked within the UK, but for the rest of its journey it may not may not be tracked and you may or may not be able to find it on the website of the foreign postal administration. It is this uncertainty, I think, that these changes are designed to address. The proposal is that ISF will be replaced by Signed or Signed and Tracked, while Airsure will be replaced by Tracked. But pricing will probably be affected. Currently the prices for these services are about the same - ISF is £5.30 and Airsure £5.40 (or £6 to EU countries as VAT is added to a price of only £5 - a distinction I've never understood). I think we can assume that in addition to any other price rises next year, this could see a premium price for the service that combines both signature and tracking - even though we can currently get that for some countries anyway! Two other changes - the first of which isn't likely to affect senders of small items - is that there will be no 'registered' service (ie International Signed For) available for surface mail following agreement at the 2012 UPU Congress. The other is the reduction in size limit for international letters from 245 mm to 240 mm in line with the domestic letters limit. 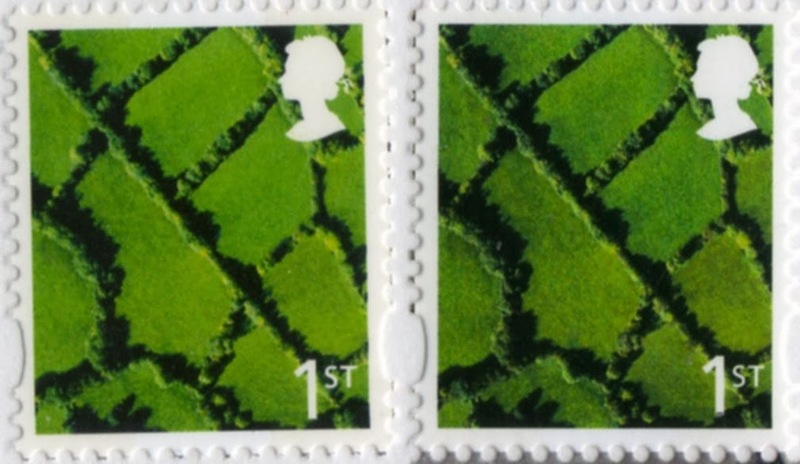 If the same pattern as this year is followed for 2014, we may see Royal Mail say again, "The new dimensions-driven definition of formats will not be applied immediately. Customers will be given time in which to adapt to the change and will be informed before the new pricing methodology comes into force.". The sizing of 245 mm was mentioned in the 2013 consultation, but I don't think it was ever implemented. I've quoted what seem to be the key points below, but for full details download both the documents against the Overseas Letter Post Scheme consultation here. Oh, and while I think of it, this was published on 9 December 2013, and responses are required by 5pm on Monday 6 January 2014. 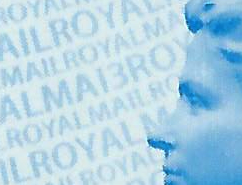 Royal Mail is undertaking this consultation exercise in relation to proposed schemes in accordance with the requirements set by our regulator, Ofcom. • Customers may not always be clear whether certain features (e.g. tracking) are included in a particular product. • We propose to restructure our UPU Registered product, International Signed For into two variants so that customers are clearer about what the service provides. International Signed includes a signature on delivery, whilst International Tracked and Signed will provide full tracking and obtain a signature on delivery. For both products compensation of £50 will be included in the event of loss or damage. • Our UPU Express product Airsure will be renamed International Tracked to more clearly explain that the product offers end to end tracking. 13. Within the current Overseas Letters Scheme, the maximum letter dimensions are 245 x 165mm with a maximum thickness of 5mm. The maximum dimensions for a domestic letter are 240 x 165mm with a maximum thickness of 5mm. To increase the simplicity of the portfolio, we therefore propose to align the international letter dimensions to 240 x 165mm with a maximum thickness of 5mm to ensure consistency with the domestic portfolio. The maximum weight of 100g will still apply in line with domestic letters. 14. Within the current Overseas Letters Scheme the term ‘packets’ is used to describe items that are not letters or Printed Papers. In recent years Royal Mail has adjusted its terminology and now refers to such items as ‘parcels’ both on our website and in our literature. This change more closely reflects terminology referred to in the market place and used by our customers. Therefore the new Overseas Letters Scheme will follow this convention and replace the term ‘packets’ with ‘parcels’. 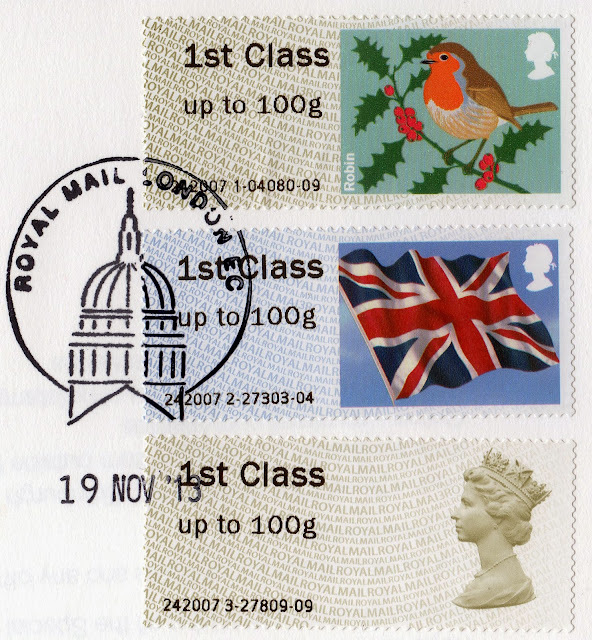 Postage Due Faststamps from BPMA in 2014. 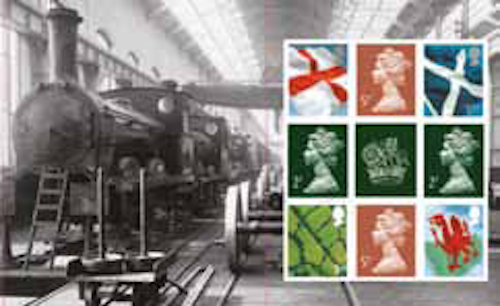 "The British Postal Museum & Archive (BPMA) has announced that it will be introducing a new commemorative stamp issue to its Post & Go machine at Freeling House on Wednesday 19 February 2014 to mark the Centenary of the introduction of Postage Due labels. These will be available until 5 April. 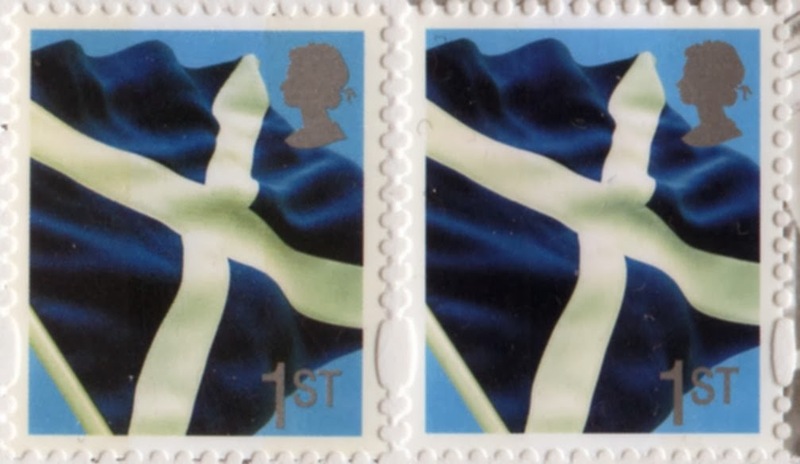 "Both the existing Machin and the Union Flag designs will bear the underprint * “The B.P.M.A./ Postage Due 1914” and a limited number of BPMA specific first day covers will be available for purchase both at Freeling House and through the online shop – details to be announced. 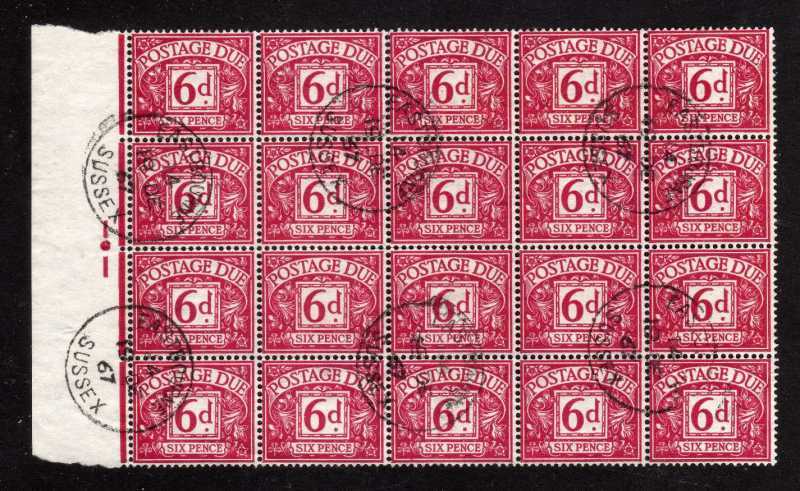 "Introduced in 1914, Postage Due labels helped to combat the problem of uncollected revenue that had been a source of concern for some time to the Post Office. GB Postage Due labels were designed by George Eve, with the design remaining the same for over 50 years. 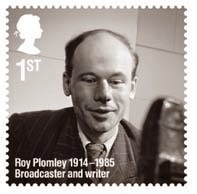 "The Centenary will also be marked through a small two panel display in the BPMA’s Search Room Foyer at Freeling House, Phoenix Place, WC1X ODL over the same period the commemorative stamp issue will be available. The opening of the display coincides with Spring Stampex 2014, held locally at Islington’s Business Design Centre and will be available for free hire for groups and societies following display at BPMA." 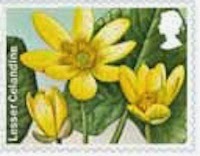 The alert among you will notice that the date of introduction of this is the first day of Stampex, which is the same day that the first Flowers Faststamps are available. * Why BPMA use the term underprint is totally beyond comprehension. I suppose they are trying to find an alternative to the term 'overprint' which we know it isn't. 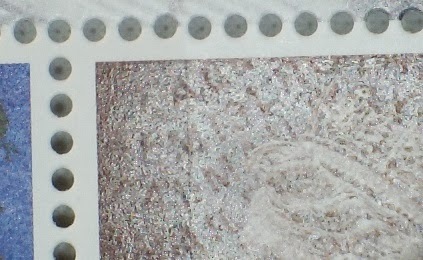 As described this appears to be a normal caption added to the service indicator and technical detail printed on to the base stamp stock. ‘1843 – 2013 Celebrating 170 years of A Christmas Carol’. ‘A Christmas Carol’ was first published on Tuesday 17th December 1843. Set in Victorian London during the 19th Century and telling the tale of Ebenezer Scrooge, the book initially sold six thousand copies when it was first released. 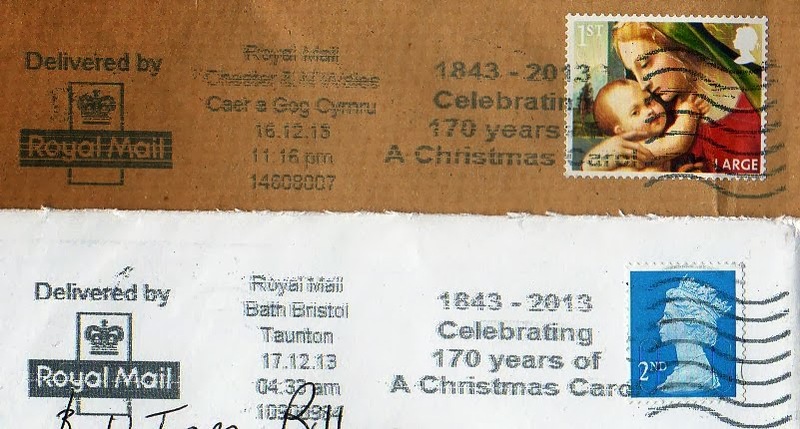 A second slogan postmark will mark the 170th anniversary of the first Christmas Card. ‘1843-2013 Celebrating 170th anniversary of the first Christmas card sent’. 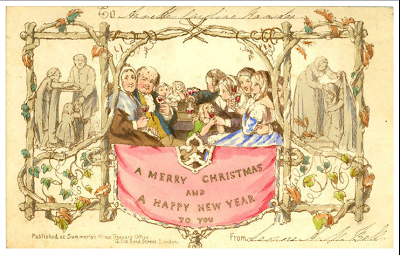 In 1843, Sir Henry Cole, a lifelong civil servant, commissioned the first Christmas card. 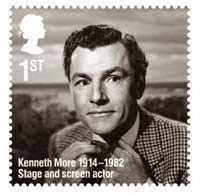 Three years earlier, he played a key role in helping introducing Royal Mail’s Penny Post service. Only 1,000 of these cards were printed and sold for a shilling each – this meant that they were a luxury item and were not within the means of the working class. As already announced the designs for 2014 Faststamps will be flowers and foliage. As announced in some places, but not everywhere, the issue date will be the Wednesday, ie the first day, of both Stampex events. 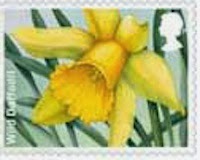 This break from tradition means that those attending Spring Stampex for the Welsh Railways issue on Thursday, will find the flowers already in the Post and Go machines. 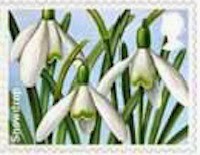 The three sets of Fastamps will be Spring Blooms (19 February), Symbolic Flowers (17 September) and Winter Greenery (13 November). There will be no pictorial issue in the summer. From the top: Primrose, Snowdrop, Lesser Celandine, Wild Daffodil, Dog Violet, and Blackthorn. As usual they will be available with 6 service indicators added. Printed as usual by International Security Printers in gravure the stamps are designed by Kate Stephens using illustrations by Julia Trickey. 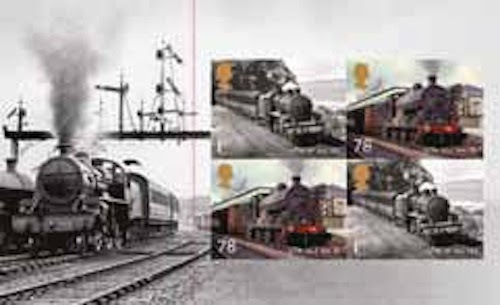 The last of the Classic Locomotives miniature sheets will be issued on 20 February 2014 at Spring Stampex, but there will be no self-adhesive retail booklet at this time. 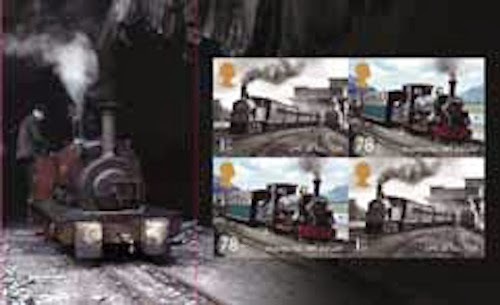 Instead a Prestige Stamp Book will be available, which will include stamps from all four miniature sheet issues. The final set includes some classics of the Welsh railways in their prime, including narrow gauge locomotives. An eagle-eyed reader has noticed that on these images the 1st class Welsh loco has a different caption on the miniature sheet (LMS 2F No. 7720) to that on the PSB pane. Having examined the actual stamps I can confirm that in both cases the caption is LMS No. 7720. 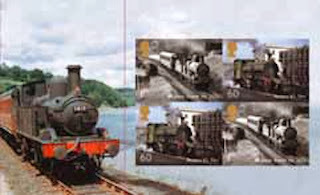 Some of the earlier stamps included the locomotive class, (7720 is a class 2F) but the Wales stamps do NOT include the class. Prestige Book - printed by Joh Enschede in litho. We now have the PSB panes and can show the definitives, which are coded M13L MPIL. This is much more difficult to see than on earlier panes by other printers, and not even as easy to see as on the Enschede-printed Merchant Navy pane. 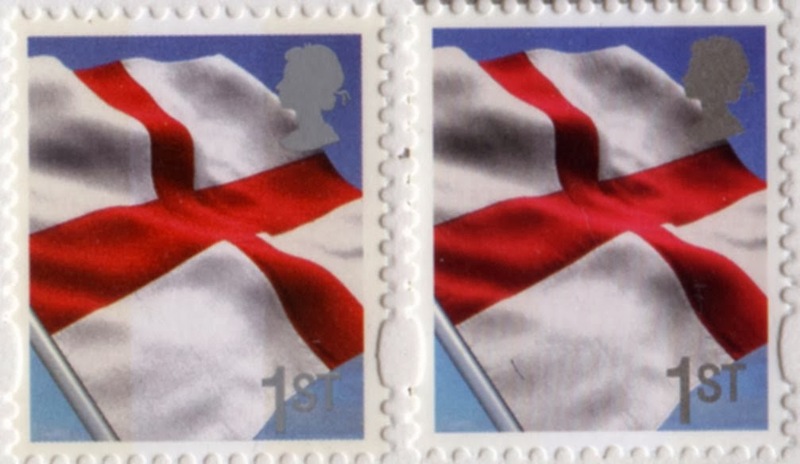 The reproduction of the Country definitives is very similar to that in the Football Heroes PSB, but the phosphor is more visible on those with a yellowish tinge. In the pictures below, the Football Heroes stamps are on the left and the UK Locomotives on the right. 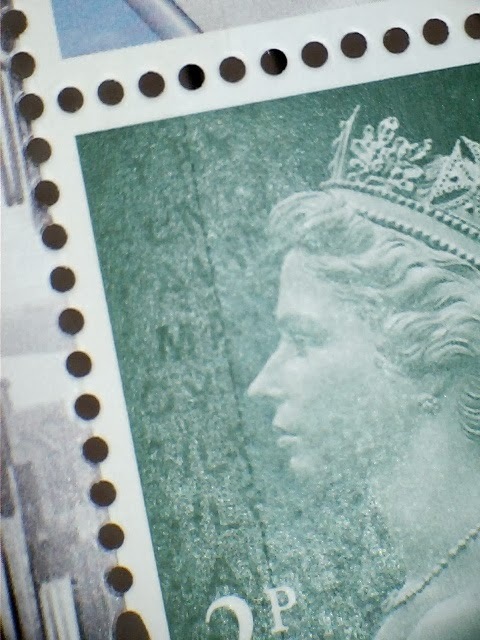 Canada Post drops a bombshell with huge stamp price rise. Ever since the part-privatisation of Royal Mail, there has been speculation concerning the continued validity of stamps with values expressed as a service, rather than a monetary value - 1st, 2nd, Special Delivery, etc. In January TNT Dutch Post announced that all Guilder-valued stamps would be invalidated from 1 November, with no option of exchanging them for Euro-valued stamps which have been in use since 2002. 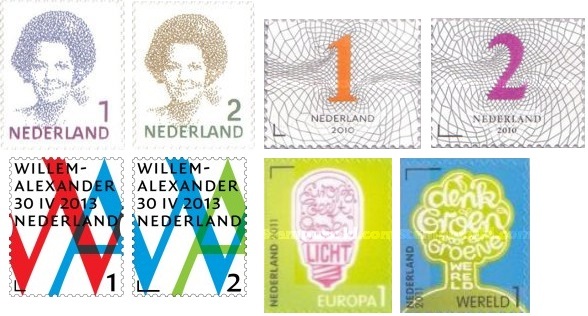 A court case ensued brought by the Dutch Stamp Dealers Association, during which the TNT lawyer casually mentioned that Euro-valued stamps would cease to be valid also - that means all stamps issued from mid 2001 to mid 2010! 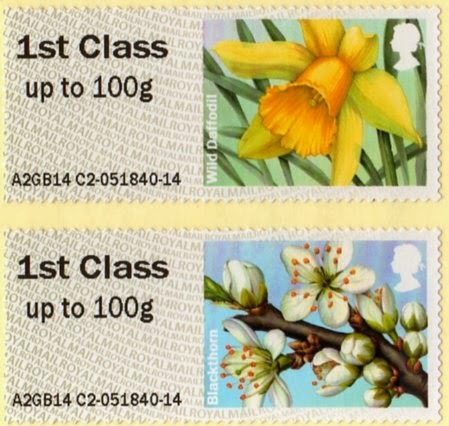 Since mid 2010 the stamps have a rate indicator instead of a value, like '1' for inland mail up to 20 gr. 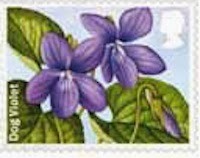 Now Canada Post has stunned collectors and dealers alike by announcing a new basis of stamp sales. Their current inland letter rate - served by stamps denominated 'P' for permanent (what a joke!) - is 63c. Canada Post will introduce a new tiered pricing structure for Letter mail mailed within Canada, which will better reflect the cost of serving various customer segments. Under these changes, the majority of Canadians, because they buy stamps in booklets or coils, will pay $0.85 per stamp, with discounts for customers that use the mail most. The minority of consumers who purchase stamps one at a time, which represents an estimated 2 per cent of stamp purchases, will pay $1 per stamp. The average Canadian household purchases fewer than 2 stamps per month. These stamp price changes will take effect March 31, 2014." 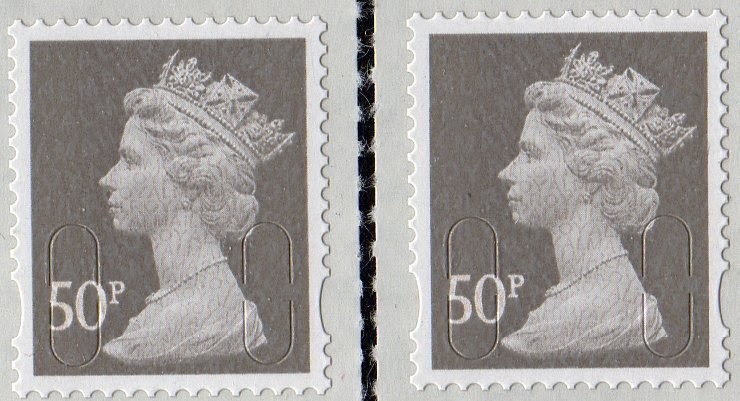 But not only will the price increase by 35% (59% if you buy just one stamp), but all 'P' rate stamps have been summarily removed from sale at Post Offices and the Philatelic Bureau, including those in quarterly packs which collectors often don't buy as soon as they are issued. All the POs were told by e-mail to remove all the "P" stamps from sale. If they sell any "P" stamps and Canada Post finds out, they will face repercussions. The only stamps that are now sold at POs are stamps with the 63¢ value on them. 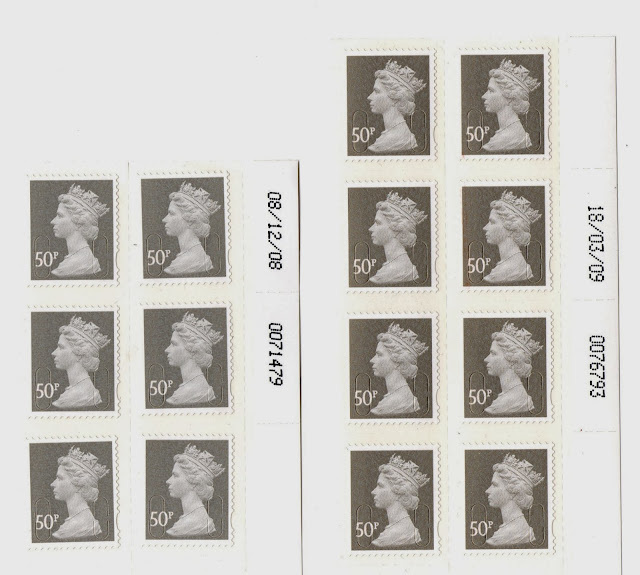 This explains why the Christmas stamps are denominated at 63c instead of 'P'. 5,094,694 people get door to door delivery in Canada. Average cost per address is $269. 3,804, 574 get mail through group mail boxes. Average cost per box is $117. So they are also proposing to end door to door delivery to urban addresses. Note though, that just as Royal Mail said that the average UK household only spent 50p a week on stamps (before the 2012 rise), Canada Post reckons their citizens buy fewer than 2 stamps a month on average. I'm now able to show the three Faststamps dispensed from machines at Tudor Street in mid-November. 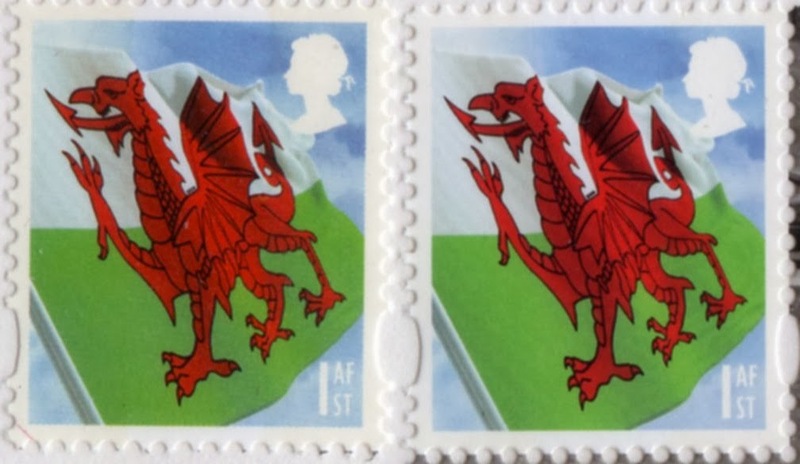 The Robin had, of course, already appeared from Wincor-Nixdorf machines at Trafalgar Square (12th) and Norwich (13th) but this was the first Post Office appearance of the Machin Head and Union Flag stamps with MA13 year codes. It will be interesting to see when they appear in other locations, given the reporting of everything from Birds 4 to latest issues at Post Offices around the country! Tudor Street - Machins, MA13 in machines 1 & 3. 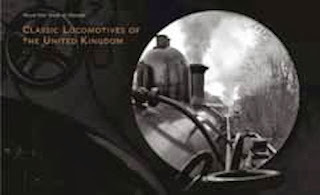 Union Flags, no date in machine 2. A complete waste of time, and in testing each machine with a single stamp purchase - machine 1 did not give a stamp, and machine 3 did not give a receipt and there was nobody there to complain to. We can now show the First Day Cover for the pair of 2nd class Faststamps sold at the Newcastle Pop-up shop on 20 November. A very limited number now available at our shop. 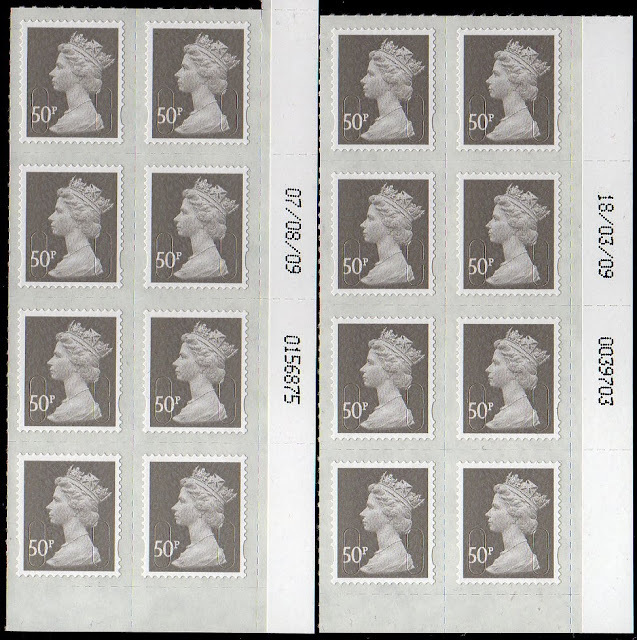 Collectors will recall that the security stamps were originally issued in 2009 with no specific year code - the word MAIL appearing where later there was a numeric code. 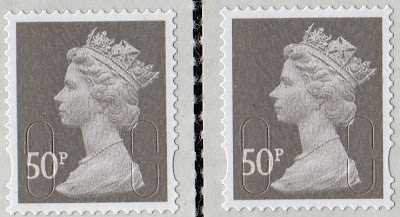 Whilst most of the NVI stamps - 2nd, 1st, 2nd Large, 1st Large - were subsequently reprinted every year with relevant year codes, the Signed For pair only occurred with MA10 codes, and the £1 ruby didn't appear until 2011 (M11L). The £2 arrived in 2013 (MA13) - but for the others we will only know if they were even printed when actual examples are found. 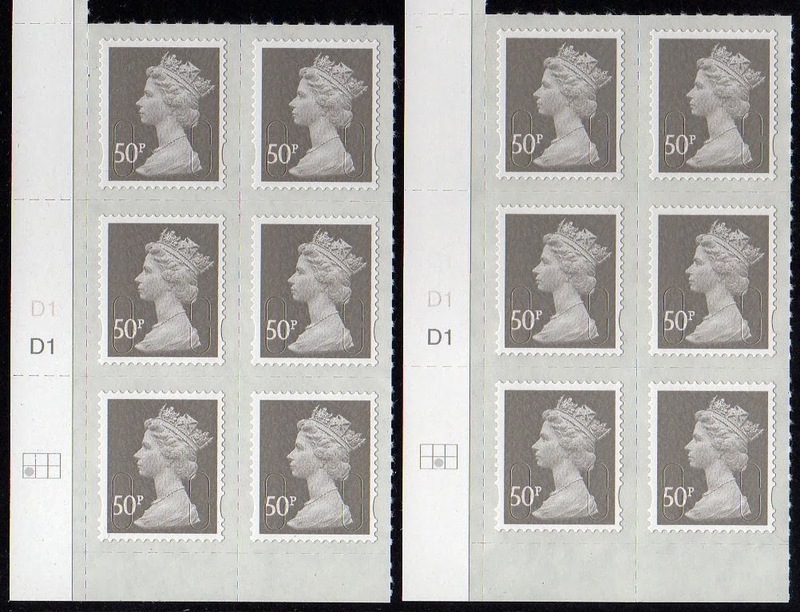 But a recent discovery suggests that the 50p light grey (replaced this year with the slate-grey version) won't be included - because a printing of 07/08/09 has now made an appearance. If it has taken that long to use the original printings of 08/12/08 and 18/03/09, it seems unlikely that there were more printings in 2010 and subsequent years. The only difference I can see is that the bottom margin is deeper on the later printing, but this may not be a constant variation. As seen on the cylinder blocks, there are 6 grid positions on the new printing, as there were on the earlier ones. Jim has sent this comparative picture of the 18/03/09 printing with the earlier 08/12/08 printing. As you can see the later one is much darker. A note to customers on the Faststamps situation. 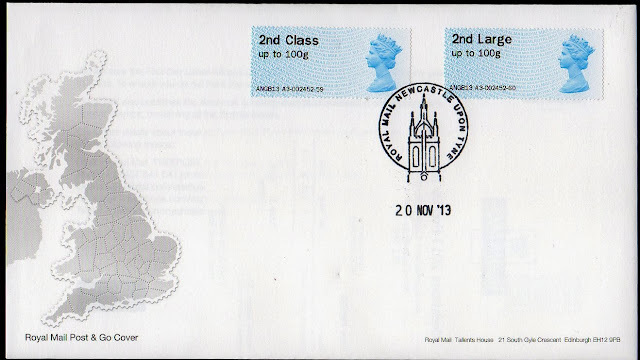 We now have the 2nd class MA13 Faststamps from both machines from the first day at Newcastle and we will have a few first day covers, probably by next week. We also now have stocks of MA13 Robins from the BPMA with collectors strips now added to our shop to accompany the 1st class singles. FDCs will also be added soon. MA13 Robins from Post Office branch Wincor machines are also in stock, and FDCs from Trafalgar Square are expected next week. 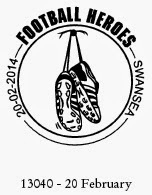 If the items you want are not listed in our shop please email to have them reserved. 2nd class MA13 Faststamps at Glasgow - and where else? 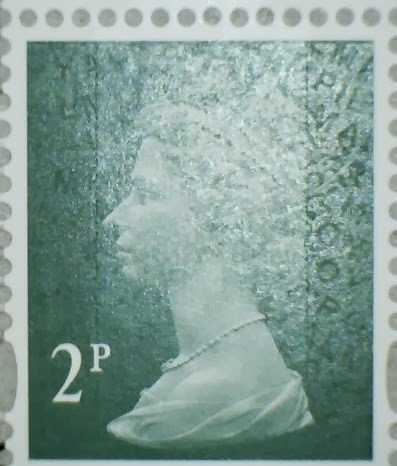 A pair of 2nd class Post and Go stamps listed on eBay and bought on Glasgow's 2nd day is reported to have the MA13 code. This is from session 2570 on Machine A4. However the image doesn't show the stamp clearly so I will be happy to report any other findings as the trailer goes further on its journey! Doctor Who Day - Maximum Cards Half Price offer !! To celebrate Doctor Who Day or The Day of The Doctor, the 50th Anniversary of the first broadcast, we've cut all our Doctor Who maximum cards to half-price for the week-end! What's a Doctor Who Maximum Card ? Real stamps used for postage on all orders of course, including at least one Tardis stamp! Buy here but hurry - only limited supplies and mostly no more than two of each!